Lancashire’s Mark Feeney has won England Golf’s Volunteer of the Year Award for the way he has transformed junior golf at his club. 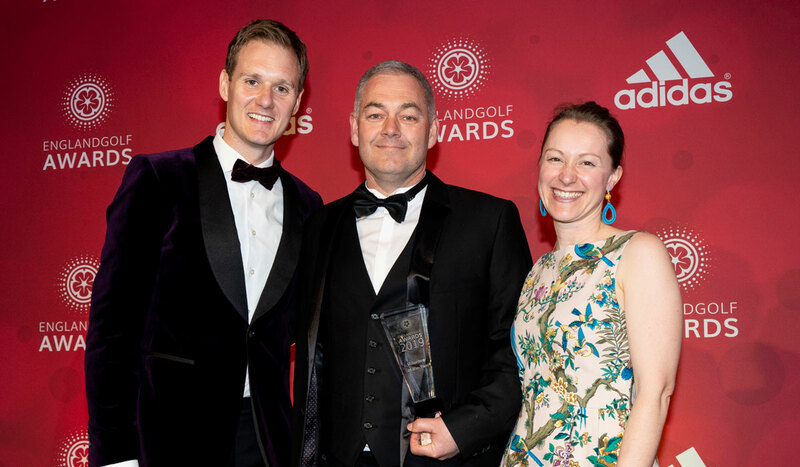 “I’m stunned,” said Feeney, from West Derby Golf Club in Liverpool, after his win was revealed at last night’s England Golf Awards 2019, sponsored by adidas Golf. Feeney was applauded by over 400 guests at the Royal Lancaster London when they heard how he breathed new life into the club’s junior section. In just a couple of years he grew it from two or three players to over 40 members. “This is wonderful for the club, it’s amazing. It’s not just about what I do. If the parents didn’t bring the kids and if the club didn’t back me I wouldn’t be here. It’s a joint effort,” said Feeney. The judges paid tribute to the way Feeney encourages and supports the youngsters, inspiring a love of the game. He’s been a club member for around 15 years but only realised that the junior section was tiny when his son, Jack – now nine – wanted to start playing the course. The club agreed to offer free junior membership for the first year – it’s now £50 – and let Feeney set up a short course. He was off. He spread the word among other parents he met at driving ranges, gathered ideas to make golf fun, enlisted the admin support of his daughter, Eva, 13, and before long the youngsters were flocking to the all-ability sessions. They play every Sunday and about 20 of them will soon be gaining their first official handicaps. They compete for 21 trophies and Feeney is delighted that 19 different players were the winners last year. The presentation evening attracted 140 people! Susanne Lesley and Owen Lewis of Royal Ascot Golf Club, Berkshire. Judith Sandford of Cheadle Golf Club, Cheshire. Marcella Tuttle of The Links, Newmarket. Caption: (from left) Event host Dan Walker with Mark Feeney and Jenny Betteridge.